Berry, Stephen Ames. The Battle for Terra Two . Tor 1986. What if: The US never developed the bomb, Nazi Germany did and Hitler was assassinated in July 1944. Series note: Four-volume series composed of The Biofab War , The Battle for Terra Two , The A.I. War , and The Final Assault . The first volume is, however, not allohistorical. Summary: A war against insectoids shifts from our Earth to another, with a look at fascist Boston. 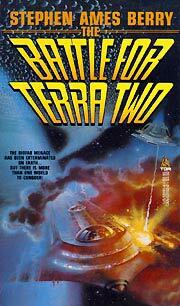 Series note: Volume two of the Terra Two Sequence. Published: Tor 1986 (0812531914BUY, 0812531922BUY). Series note: Volume three of the Terra Two Sequence. Series note: Volume four of the Terra Two Sequence. Comments: Title and copyright pages do not agree on exact title. Published: Tor 1988 (0812531892BUY, 0812531906BUY).